Setting up a foreign key relationship in Rails is easy, however, the form for the relationship proved to be a bit tricky. Ideally, you want the foreign key to be selected if it’s set in the show view and you want it to save in the new and edit views. Here is how to make that happen. I’ll start from scratch here. I’m assuming you have a shell open at the root of your Rails project. We’ll make two models that have a foreign key relationship. 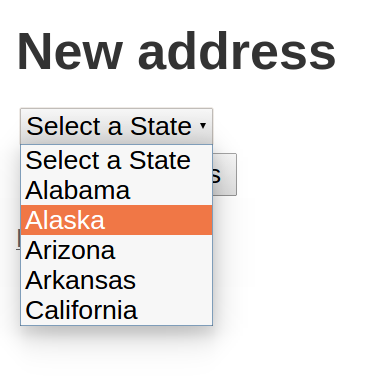 Any Address can have one state. Address has the UI, so use the scaffold generator. It doesn’t make much sense for State to have a UI, so just use the model generator. Obviously you could write these yourself as well. Also add a belongs_to relationship to the Address model in app/models/address.rbBootstrap. You can add whatever class you want. Almost done! The state_id value won't save unless you permit it in the Address controller. Go to the Address controller in app/controllers/addresses_controller.rb and add the properties to permit in the address_params method at the bottom. 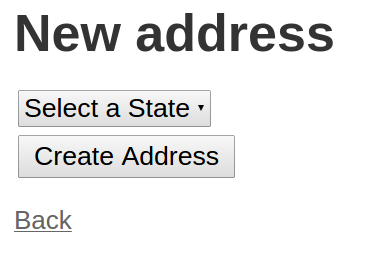 Now you should be able to save and update Addresses with their associated State via the state_id column.